Finally, Facebook is updating it’s search functionality with “Graph Search”. 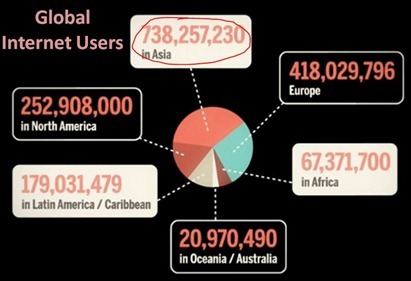 Facts: Facebook currently has more than a billion users with more than a trillion connections. And there are more than 240 billion fotos published on facebook. 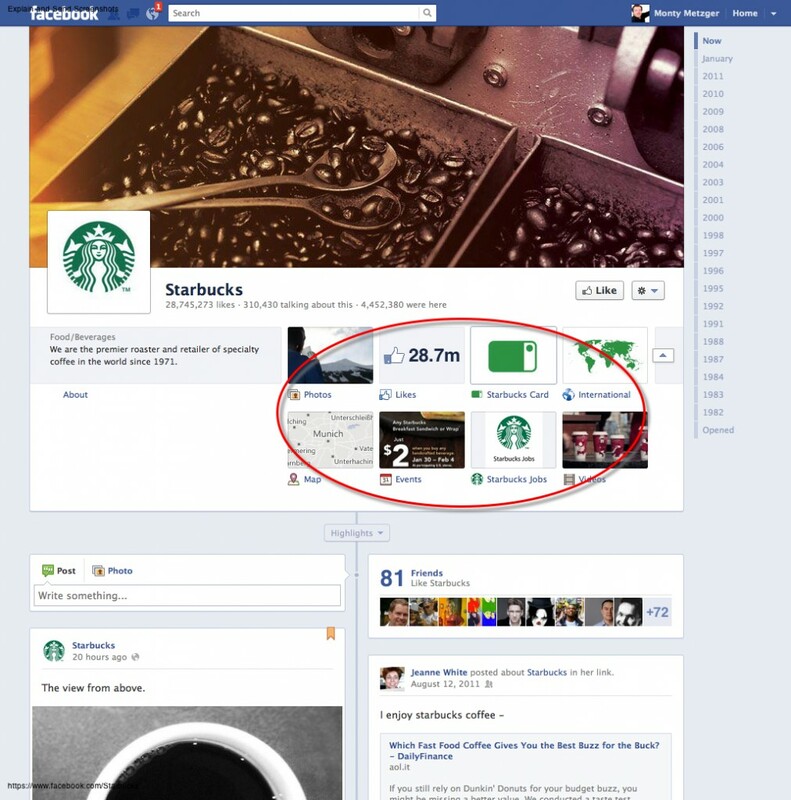 Graph Search is a new way for you to find people, photos, places and interests that are most relevant to you on Facebook. Technically it is a high-speed contextual discovery engine. “It is not web search,” Zuckerberg says. Graph Search and web search are completely different. Web search is designed to take a set of keywords (for example: “music industry”) and provide the best possible results that match those keywords. With Graph Search you combine phrases (for example: “my friends in Los Angeles who like Justin Timberlake”) to get that set of people, places, photos or other content that’s been shared on Facebook. Another big difference of Facebook Graph Search is that every piece of content on Facebook has its own audience, and most content isn’t public. Facebook built Graph Search from the start with privacy in mind, and it respects the privacy and audience of each piece of content on Facebook. It makes finding new things much easier, but you can only see what you could already view elsewhere on Facebook. Facebook has announced a partnership with the Olympic Games in London 2012 at a press event at Facebook London today. The partnership is a big step on the way to monetize the social network and its fight against Google and Twitter. Although Facebook has 10 times more Page Views that YouTube, Facebook’s revenue is still only 10% of Google’s total revenue. 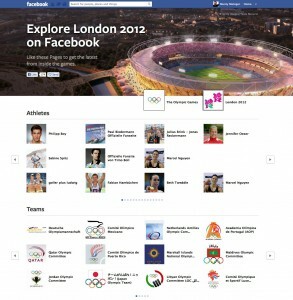 With the launch of “Explore London 2012” facebook has created a special landing page for all people interested in the olympic games. You can find an overview of all facebook fan pages of athletes, teams and sports and “like” them directly or jump to the fanpage to learn more. I am often asked why Social Recruiting is important? – People are spending more time on social media than on the open web. – 1 out of 3 job seekers use social media for their job search. 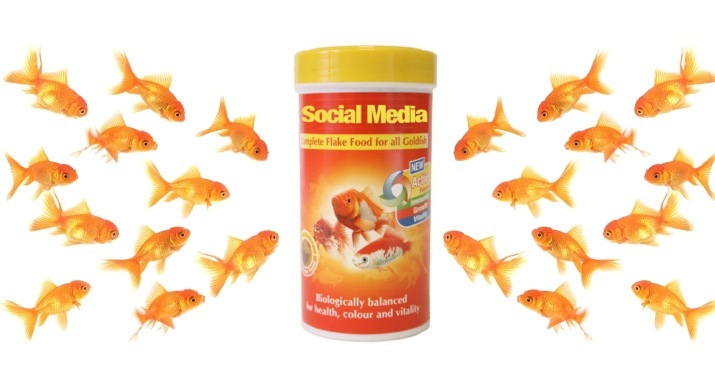 – While 9 our of 10 active & passive job seekers have one or more social media profiles. – Facebook is the leading social network, while new social platforms (Google+, Pinterest), regional (VK.com, Orkut, Mixi) and niche social platforms (LinkedIN, XING, Viadeo) are growing. Today Faceook introduced Timeline for Facebook Pages during their first FMC (Facebook Marketing Conference) in New York City. Here are the core features facebook is presenting. Brand your Page: Add a unique cover photo and showcase your most important news on your Page timeline. 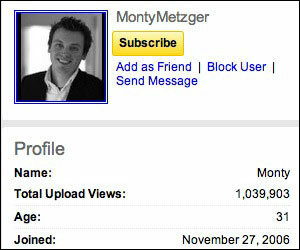 Highlight what matters: Pin a new post to the top of your Page each week so people notice what’s important. Manage everything in one place: See and respond to your recent activity and private messages right from the top of your Page. 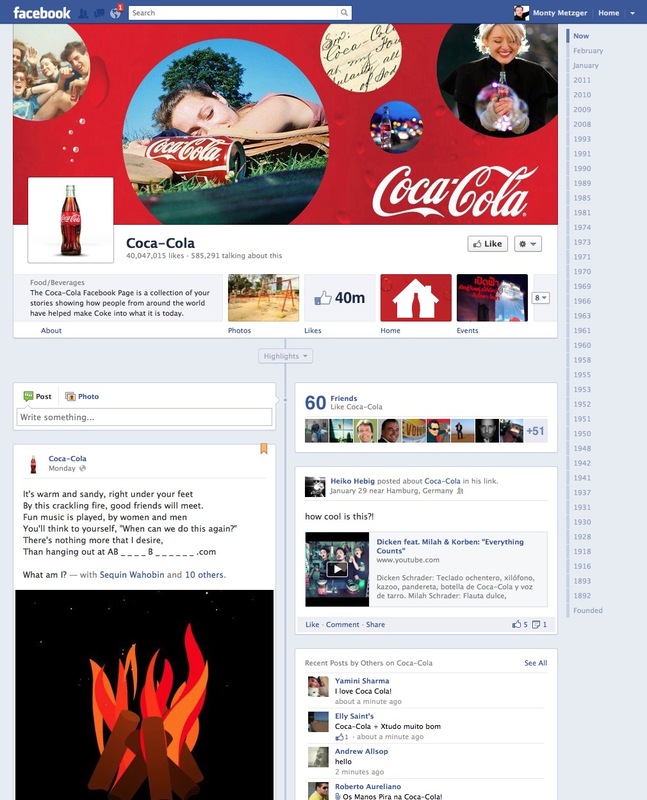 With Timeline for Pages you don’t have the left navigation bar anymore so your famous Facebook Tabs get a new place. The tabs of a facebook company pages will get more space. So your tab can be bigger than the normal 520px width. The full width of the new timeline for pages tabs are 850px (pixel). The width of the content area for the tab will be 790px. Since today a few companies have already presented how timeline for pages will look like. Here are a few Examples: Olympic Games, Nike, Starbucks, Coca-Cola. 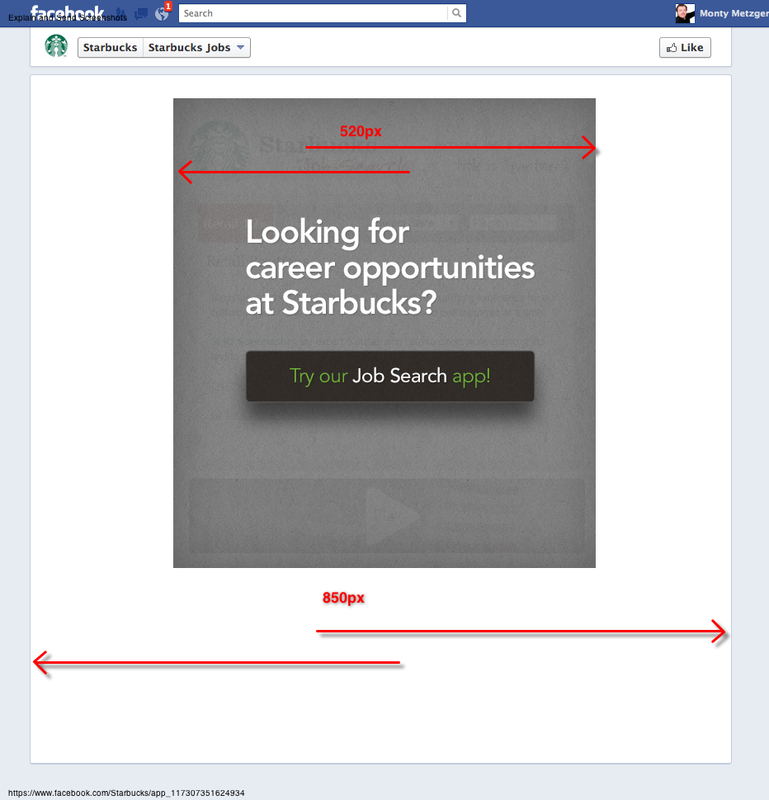 How Companies are using Social Media for Recruiting! Social Media is becoming an essential part for every recruiting strategy. 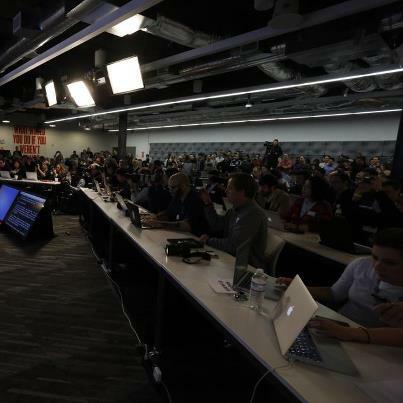 Companies are turning to Facebook, twitter and other social media platforms to find talent. Here is a well-done infographic about “Social Recruiting”. This is an exciting opportunities for all Web Developers who would like to become Co-Founders aka. Founding Employee at a well-funded new startup based in Europe (Munich / Zurich). I you are a social media addict and passionate about building scalable web platforms this might be something for you. Furthermore you would be one of the first employees and you will have the opportunity to become co-founder while getting a secured full-time salary. You will be part of our small group where everyone is part of the creative process. You will not only oversee software development, but also aspects of platform and product management. The perfect candidate is creative yet pragmatic, comfortable multitasking yet able to focus on a problem, and a fast learner. – Significant experience in building and launching strong (high-traffic) web applications. – Experience with one or more database solutions MySQL, Postgresql, MongoDB etc. – Fluent in one or more OO or scripting languages like Java, PHP, Python, Perl. – Grails or Ruby on Rails know-how. – A strong interest in social media and social networks, with some exposure to the technology/concepts behind them. – Excellent communication and documentation skills, with the ability to consistently contribute creative ideas. What’s in it for you!? – Be part in an exciting new Startup. – Excellent Compensation & Salary. 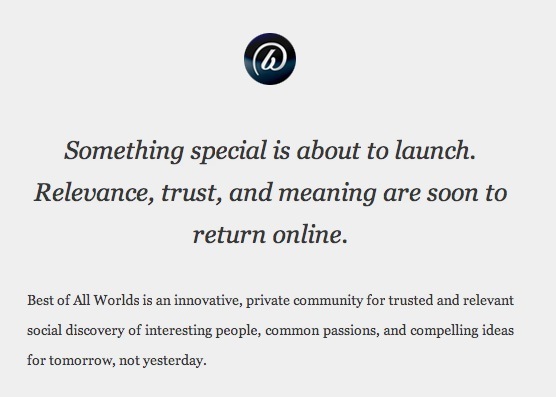 – Co-Founder Shares & stock offerings. This position is open as of 3/17/2011. Please send us your CV, LinkedIn/XING Profile and Links to your recent projects. I am currently looking for a way to to claim a iTunes Artist Page on Ping? PING is Apple’s brand new social network dedicated to Music. If I find a solution I will post it here…. One month after the release of the Movie Trailer of “The Social Network”, aka “The Facebook Movie”, two parodies are getting a lot of attention. Have a look yourself. 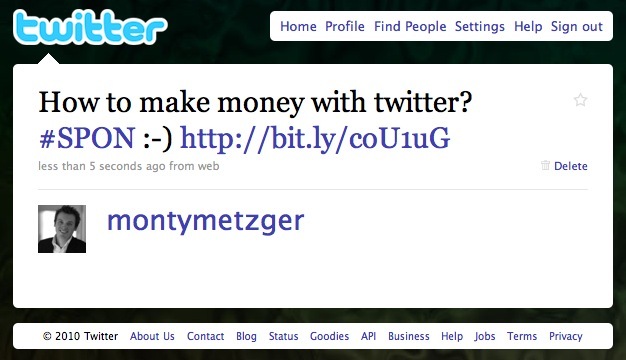 If the Twitter Management is not inventing advertising on Twitter.com the users just do it themselves. Twitter users inetgrating advertisements in their stream of updates have begun adopting new standards for disclosure. Many ads are now being marked with tags — “#spon” for sponsored tweets, “#paid” or “#samp” for those who received sample products — based on guidelines released Thursday by the Word of Mouth Marketing Assn. (WOMMA). The new instructions are a response to the Federal Trade Commission’s call for more explicit disclosure from bloggers. The Superbowl is nearly as famous for its commercial breaks as for the game itself. In fact, the commercials are more memorable than the game for many viewers – a study by ad agency Venables, Bell & Partners showed that 66% of viewers remember their favorite advertiser from the 2009 Superbowl and only 39% recall which team won. However, this exposure comes at a hefty price, rates for Superbowl commercials run far above any other TV event because the game draws around 95 million viewers in the US alone. 30-second spots run close to $3m and the game typically includes 50 to 60 spots. 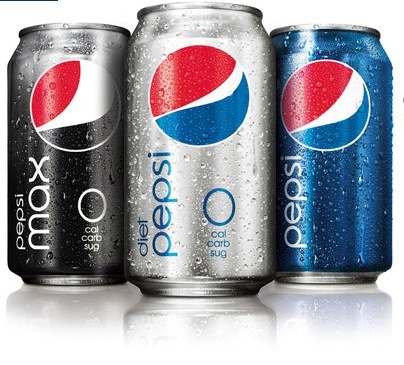 PepsiCo has advertised its cola during every Superbowl for over 20 years but it has become more and more difficult (and expensive) to stand out from the field. 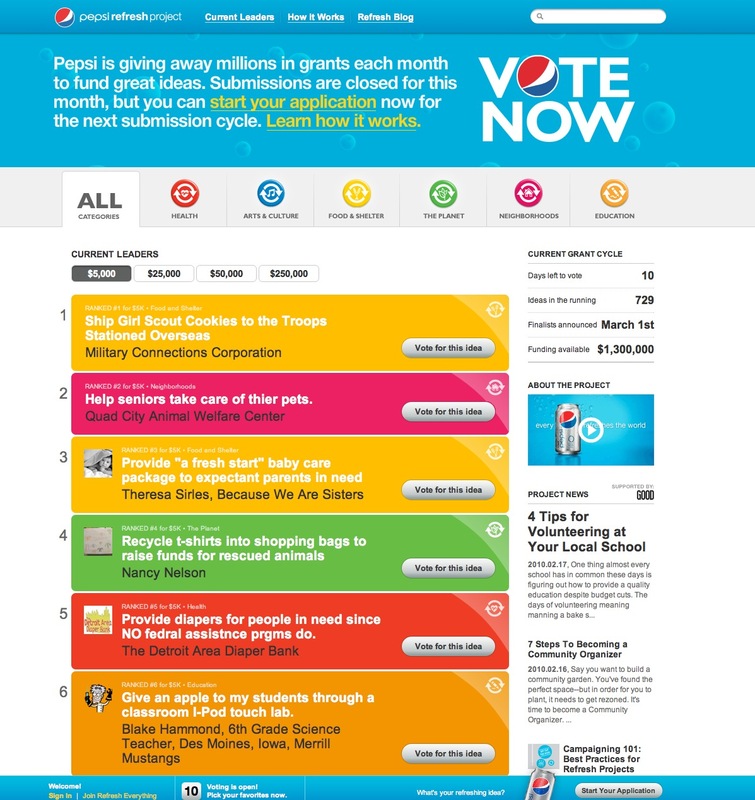 Instead of running the risk of being an also-ran, PepsiCo announced in December that it wouldn’t be advertising its cola during the Superbowl this year, instead it unveiled a $20m fund in which it is looking for people, businesses, and non-profits with ideas that will have a positive impact on US communities. Anyone can submit and rate ideas and each month those rated highest receive grants of between $5k and $250k. Moving away from the norm seems to have worked, in a recent survey by Nielsen, Pepsi’s ‘Refresh Everything’ campaign accounted for more than 21% of the media coverage and online buzz around Superbowl advertising. Given that PepsiCo usually spends in the region of $30m on Superbowl advertising breaking away from the norm seems to have paid off.